If I had a French patisserie near where I lived, I probably wouldn’t be bothering with this post! When I need a quick dessert, I hope that I’ve got some nice ready-made puff pastry and some suitable fruit in the fridge and knock together this tart. It goes under a variety of names and “rustic fruit tart” seems to be the most popular. Of course, a homemade pastry is best but when you’re pushed for time (read: desperate for a sweet), ready-made has to do; I was pleased with the all-butter puff pastry I found at Waitrose. First, roll out some all-butter puff pastry (I rolled out approximately a third of a 375g block) into about a 3mm thick sheet – shape isn’t important but aim for semi-roundness! Place it on a baking sheet lined with parchment paper. Then gather together your fruit. 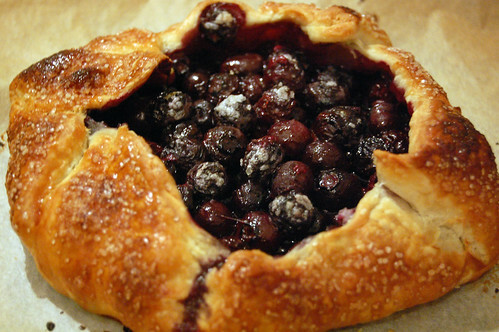 Blueberries, apples, pears, peaches, nectarines, apricots, plums are all suitable for a pie like this. Of course, chop up the fruit to cook faster! I mixed blueberries with about 2 tablespoons of caster sugar and a 1 teaspoon of cornflour/cornstarch and then piled the lot in the middle of the pastry sheet. Fold the edges of the pastry sheet over the fruit, brush the exposed pastry with beaten egg yolk and sprinkle the top with some more caster sugar. Bake it in a preheated oven at 200 degrees Celsius – a tart this size needs baking for about 30 minutes. The pastry should be golden brown and the fruit cooked through and their juices bubbling. Serve – this serves between 2 to 4 people. A bit of creme fraiche or ice cream would be lovely with a slice! This sounds great, so quick too! It’s a good thing you don’t have a french patisserie nearby – then you wouldn’t be sharing these amazing recipes and photos. I’m a chocolate fanatic but really need to stop eating so much of it! I am hoping that when the summer hits and so much fresh fruit is in season I’ll be eating more of that – even if it is surrounded by pastry! Claire: No, I haven’t but thanks for the recommendation! I pass it often but have never stopped. There seems to be a little Chinese takeaway on the Askew Road that also does Singaporean and Malaysian dishes but I’ve never really looked at the menu properly. So, now two more reasons to wander down the Askew Road properly! Ruslim: I’m pretty positive you’re spam but you’re awful kind spam! Maris: Ah, you are too kind! And you’re right, I would certainly eat more fruit if it was pastry wrapped! Walk into Askew Road’s Laveli bakery and cafe and you will be amazed by an exquisite display of pastries, cakes and bread. Twelve different sorts of bread, pastry, savouries and sweets, from Framboise tartlets to Clafoutis all arrayed in the window and behind a long shiny glass counter stretching down the shop. This is a display which you might expect to see in Harrods, but its something of a surprise to happen upon next to a Co-op and a closed-down florist shop. And it just gets more fanciful. It turns out that everything is created from scratch by one lone baker, Slovakian Libor Matlovic, who has worked at some of London’s most prestigious Parisian patisseries. “He never sleeps, he bakes all night, he just loves baking” laughs the lady behind the counter, one of three part time assistants. And indeed she’s right, Libor admits that his typical working week has been 100 to 120 hours since he and his wife Veronica, who runs the retail side, bought the business in October. That’s partly because opening hours are 7.30 to at least 6pm seven days a week, but mainly because everything is made the artisan way, using the best ingredients. The site, formerly Alban bakery, has had a complete refurbishment since the couple fulfilled their dream and bought it, funded by a private loan. No surprises they did the refit themselves, ripping out the flooring in the cafe area and putting down wooden floorboards, with new wooden furniture and even a children’s play area. There is a feel of Ikea to some of the decorations. You can get everything in one place there, and it’s the convenient option as they don’t have a car, Libor explains. He says: “We wanted a warm atmosphere, comfortable, welcoming.” The couple plan to add some sofas and wi-fi access later on, Veronica adds. It is all a work in progress, there are so many things that they have planned that they have not had time for yet, she adds. But things are starting to come together she says, as word of mouth recommendations bring more and more customers to the door. Indeed, the business sources its fruit and vegetables from the nearby greengrocer, and it turns out Libor recently had his hair cut at the barber a couple of doors down. So he does have some time off! A recession is not a great time for a high class bakery to start up in business, but if hard graft and sheer quality can make the difference than Askew Road’s newest arrival will be fine. Laveli’s are opening another branch of their cafe and bakery in Churchfield Road Acton in the next couple of weeks. Actonians can’t wait – they came to the market for a while and their stuff is fantastic and it will be so great to have a proper coffeeshop again. sara: Thank you so much for this fantastic news! I haven’t seen them at the Acton Market lately – I used to pick up a few things now and then when I saw them. Gorgeous breads. And now I can get it every day!